American Foundrymen's Society. PAPERBACK. B01NAM3BDE 1980 first edition, American Foundrymen's Society (Des Plaines, Illinois), 4 1/8 x 6 7/8 inches tall paperbound, , 107 pp. Very slight rubbing, creasing and edgewear to covers. Stamp of Central Indiana Chapter, American Foundrymen's Association, to blank versos of front and rear covers. Otherwise, a very good copy - clean, bright and unmarked - of this scarce and useful foundry reference. ~K~ The information generated in this reference has been categorized, where necessary, to cover the application of the various base sand additives in the manufacture of steel, gray, ductile and malleable iron castings, as well as nonferrous and light alloy castings. 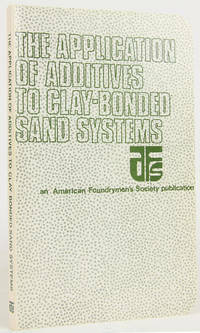 The American Foundrymen's Society Committee 80-H, 'Foundry Sand Additives,' has attempted, with the wealth of information contributed by its members, to categorize the various sand additives. Each group of additives has been broken down to a simple format, actually naming the material and describing it, outlining the possible and probable limitations. When the metalcaster requires additional information and advice on specific additive applications, this committee recommends consultation with the specialists and individual manufacturers of those additives. Contents: Carbons; Clays; Cellulose; Chemicals and Polymers; Cereal and Starches; Refractories; Water; Bibliography; Additive Trade Names; Additive Manufacturers; Table of Elements; Temperature Conversions; Glossary; Index. . Very Good. 1980. First Edition.